New Orleans has spawned many a tale of ghosts and dark forces, but few offer such a lively mix of sass and danger as Royal Street. Part paranormal thriller and part homage to New Orleans, Ms. Johnson’s debut novel is more fun than a barrel of zombies. Meet Drusilla Jaco (aka “DJ”), Junior Wizard Sentinel for the Big Easy. Raised by her wizard mentor, Gerry St. Simon, after her growing childhood powers proved too much for her family, DJ is one of the city’s magical guardians, protecting New Orleans from supernatural threats. Unfortunately her relatively low spot on the totem pole keeps her tasked with busywork like brewing potions and chasing off stray pixies. Then Hurricane Katrina veers north, straight for the city. With the storm surge, broken levees, and horrible devastation come a shattering of the already-thin wall between the normal world and the Beyond, home to the spirits of the dead. Now DJ’s being stalked by the all-too-solid revenant of Jean Lafitte, her mentor Gerry is missing, and someone—or something—is marking wizard’s houses and murdering National Guardsmen, leaving voodoo signs near the corpses. The Congress of Elders, stiff-backed and stern overlords of the magical community, want the murders stopped and Gerry found as soon as possible. To help, they’ve sent magical Enforcer Alex Warin. Technically Alex has been ordered to be DJ’s partner—but Enforcers don’t have partners. Especially when they’re as stubborn and insufferable as Alex, who replaces her beloved junk food with nasty MREs and keeps trying to tell her what to do. Fortunately DJ is a poster child for stubbornness herself. Finding Gerry and stopping the murders means uncovering secrets that have been hidden away for decades: uncomfortable secrets that some people will do anything to keep hidden. It wouldn’t be easy under normal conditions, and dealing with returned spirits like Lafitte and Marie Leveau while wading through Katrina’s aftermath makes it even more difficult—and deadly. New Orleans’ warm casual milieu has always cast a magical spell for visitors, and Ms. Johnson reveals her deep love for the city with a setting rich in flavor and texture. 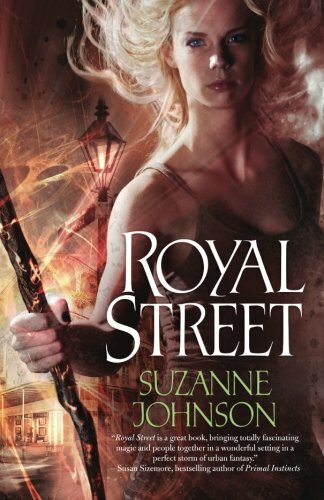 Royal Street is paranormal fantasy for readers who like to savor wry humor and vivid characters as much as dark magic.